Dear Justine Greening – please save our school libraries! Today a missive has been fired in the battle to try and halt the fast rate at which school libraries are closing. With school budgets increasingly squeezed, it is very often that school librarians find they are suffering. ‘Best’ case scenario is that the school library finds that it has no operating budget, and so pupils are left without access to the latest and best children’s books, including the prestigious Carnegie Medal books. Worst case, the library is closed, or they make the librarian redundant and let the ‘library’ stumble on as a room full of books. For of course, as we all know, a room full of books doesn’t become a library until and unless it has a skilled practitioner at the helm. And a budget! Former school librarian, author, and past CILIP President Dawn Finch had had enough. 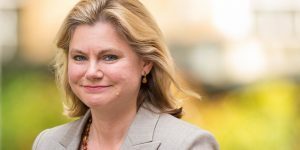 After one particularly poignant tweet she decided to contact Nick Poole, the CEO of CILIP, and together they drafted a letter to Justine Greening. As Chair of CILIP’s School Libraries Group I was also contacted, and was very proud to be a signatory to the letter. At about five yesterday there were about 20 signatures. Just before he went into a meeting Nick Poole tweeted that he wondered if any more authors would like to join in and sign. When he turned his phone on after the meeting. Nick said ‘twitter had melted!‘ By the time the letter was published this morning, there were 150 signatures. But authors have continued to tweet their support, and so the list of those who support school libraries is growing. The Bookseller also wrote a great piece in support of the cause. The letter has now been sent to Justine Greening, and you can read the full text of it here. There is so much more to add – as others have pointed out, we haven’t even touched on the role that librarians play in digital literacy yet, or in wellbeing. But first things first! There is also a hashtag going around called #schoollibrariesmatter. Please tweet using this hashtag. Follow @NickPoole1 @dawnafinch and @CILIPSLG to retweet all the wonderful replies. Let’s give this legs! Finally, for a piece of work connected to this, Nick Poole has asked me to collect data around the running costs of STATE school libraries. Please could you add your data to this Google Document. It is completely anonymous – all we want is Salary+budget and County. If more than one librarian included in that salary please indicate, and if zero budget please indicate too. This entry was posted in advocacy, CILIP, News by Caroline Roche. Bookmark the permalink.